If there’s one way of seriously enjoying the freedom your car offers, it’s to bang on some cool tunes while you’re on the move. The bad news is that most superminis come with tinny stereos that make your music sound like it was recorded in the bathroom. But the good news is that really good upgrades don’t have to cost a packet; good ICE needn’t be costly. Your start point is to choose a head unit; that’s the dash-mounted box with the buttons on it. The heart of any ICE installation, you can get a decently powerful head unit for £100 or so; double that for something that’s ipod-ready. If your car has front speakers only, it’s worth adding a pair in the rear; 50 notes secures something reasonable, but £100 buys something significantly better. 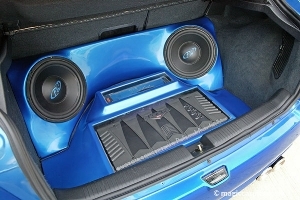 If you’ve got a bigger budget, you can add amplifiers, component speakers and all sorts of add-ons such as filters and crossovers, subwoofers and gaming systems. However, this all adds weight, increases the chances of your car getting nicked or broken into – and you’re also more likely to get nicked by the feds. Drive around with the bass booming and you could be stopped and fined or even have your car seized for anti-social behaviour. Even if you keep it simple, be wary before you start hacking about your car’s wiring because you could end up starting a fire or suffering from electrical glitches. If in doubt, choose your kit but get it installed by the professionals. Also, don’t forget to tell your insurer that you’ve been toying with your car; if it’s nicked and you’ve forgotten to tell them, they could refuse to pay out if it comes to light that you’d modified it.